This is a sponsored post written on behalf of Honey Bunches of Oats Greek. I received free product in exchange for this post. All opinions are my own. 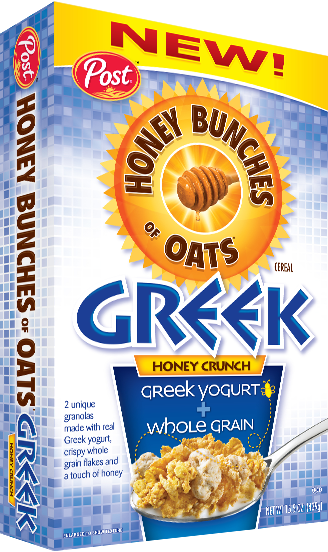 Description: With the one-of-a-kind unmistakable crunch of the traditional Post® Honey Bunches of Oats cereals, new Honey Bunches of Oats Greek Honey Crunch also mixes in the perfect combination of crispy whole grain flakes and two tasty, crunchy granola clusters made with real Greek yogurt. The original recipe of flakes and granola oat clusters, sweetened with just a touch of honey, was created in 1986. Long-time Post Foods employee Vernon J. Herzing and his daughter, Kimberly, mixed together different Post cereals, creating what would later become Honey Bunches of Oats Honey Roasted. Today, Honey Bunches of Oats is one of the top-selling cereals in America, and 50 million smiles can’t be wrong! 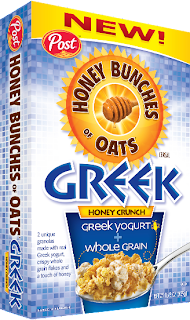 Honey Bunches of Oats Greek Honey Crunch cereal is a perfect combination of wholesome goodness and great taste in every bowl – made with whole grains and two unique granolas with real Greek yogurt in every bite! Post has enriched the lives of consumers, bringing quality foods to the breakfast table since the company’s founding in 1895. Post’s portfolio of brands includes diverse offerings to meet the taste and nutritional needs of all families, including such favorites as Honey Bunches of Oats®, Pebbles™, Great Grains®, Post Shredded Wheat®, Post® Raisin Bran, Grape-Nuts®, and Honeycomb®, as well as Attune Food's Uncle Sam and Erewhon brands. Post is dedicated to health and wellness, offering consumers a variety of cereal choices to meet their nutritional needs from whole grain and fiber to lower sugar offerings. For more information about Post Cereals, visit www.PostFoods.com. My kiddos LUV the new Honey Bunches of Oats Greek! Jessica liked it so much she grabbed the second box and hid it in her room so that the boys would not eat it!! They ate the first box so fast that I didn't have a chance to get any pictures of them eating eat! That's how it goes with 3 teenagers and their buddies! The kids and their buds give the New Honey Bunches of Oats Greek an A+! I will be picking up more boxes on the next grocery trip! Post has offered to give one reader of Dnbuster's Place a chance to try Post Honey Bunches of Oats for themselves! 1 reader will win 2 boxes of the New cereal! Please enter below via the rafflecopter form! Giveaway will end June 21 @ 12Am! Honey Bunches of Oats is my favorite Post Cereal! My favorite Post cereal is Raisin Bran. I have it as part of my breakfast every morning and it starts my day off on the right foot.